I have some heavy batteries to get up the hill and the winch had worked quite well on the wood gathering so it was time to employ the highline once again for the big 8-Ds. I was looking forward to it. Each battery weighs 150 pounds and there are three to come up and 8 to go down (I am swapping out some new for old). The plan was to load the batteries in Sal’s boat (it draws the least water) and float the little ‘barge’ under the highline at high tide. High tide is at noon today. Then we’d use the big ol’ swatch of fishing net I scavenged a year or so ago to bundle the puppies up and haul ém up the hill using the winch. The hard part was going to be the two of us on Sal’s tiny boat balancing like ballerinas while we loaded the net with 450 pounds of lead and acid. I was looking forward to that, too. Sal weighs 125 pounds. Her outboard another 150. The batteries 450 and there is maybe 50 pounds extra in ‘stuff’ on the boat as well. Her little eleven foot, shallow Whaler was carrying close to 800 pounds and did not have a lot of freeboard showing as she made her way carefully into the lagoon. Well, noon came and went and the batteries went back to the dock. We didn’t get them up. Damn tide was about six inches too low! ‘Course you could say that the batteries made the boat draw an extra six inches so that the boat was too low! Either way, we couldn’t get in close enough to use the highline, the winch or our remaining-but-fading back muscles. Still, all in all, it was a good day. 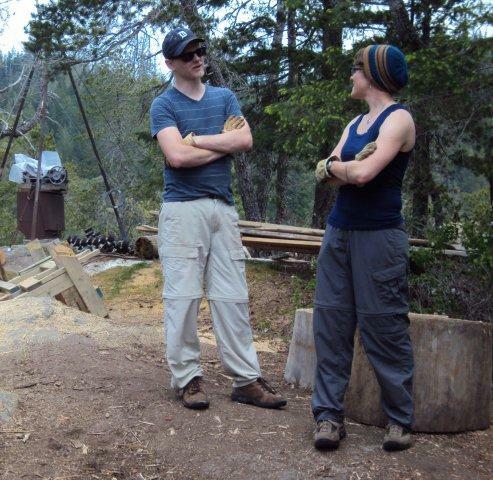 We finished up the wood (always bits and pieces and, of course, stacking) and pulled up crap and junk and let other junk and crap go down. Lots of heavy lifting and moving of ‘stuff’. Sal hates a messy yard. And no matter how you ‘cut it’ this wood is neat and well stacked! I have never seen a tighter stack job. You can see why we came up a row short – it is because the rows there are are so tight! Lindsay-from-Chicago did it with Dave-from-Chicago’s chopping. When I say, ‘finished up the wood’, what I mean is: we aren’t finished yet. 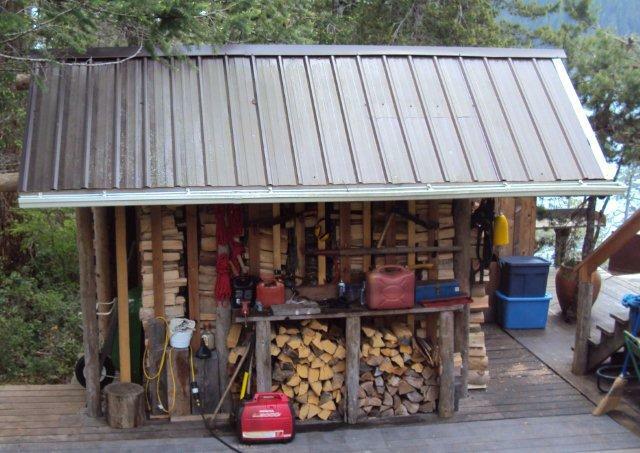 We finished what we had collected in logs-in-the-lagoon but we are still one row short of a full deck in the wood shed. That means three more 12 foot logs, maybe four have to be found, captured, wrangled and processed. But there is no doubt; we have enough in for the year. The pressure is off. The extra row is really just that – extra. 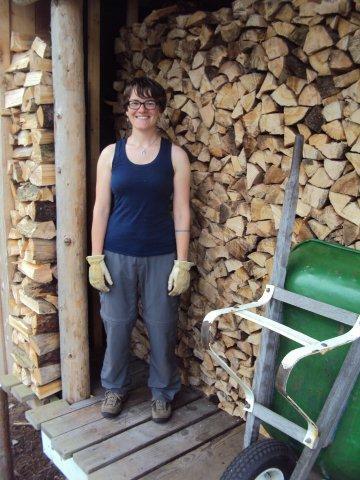 I will have plenty of time to find the logs, haul them up, cut ém in to rounds and split them while Sally stacks some day in the future. Or, maybe………….we do have some guests coming later this year…………hmmmmmmmmmmm…….